Heroes are born, not made! A true hero is one who stands in the gap to protect and preserve humanity despite what the endpoint of his actions may cost him. In the land of Germany, a hero was born on January 3, 1933, in Munich, Bavaria and he was named Rolf Steiner. Rolf which synonymously means 'Structural Integration' just as his name implies was a professional "Soldier of Fortune," who structurally integrated so many components that aided his (mission) mercenary work as a soldier. Being filled with a savior-like passion, Steiner desired to be a servant and defender of God's own people in Africa. Though, I wasn't opportuned to have a handshake with him or a one-on-one conversation but through the so many accounts of his good deeds to defenceless citizens of Biafra during the civil war, I was filled with desire to know more about the man that threw his life on the red line that we the people of Biafra will have our total freedom, thereby motivating me to drop this Tribute to him while he is still alive for him to know that the people he fought for have never and will never forget his gallant efforts in making our history come clear to the world despite the odd that followed his leaving the land of the Rising Sun. Rolf In 1949, at the age of 16, decided to study for priesthood for he intended to become a Catholic missionary in Africa. Following an affair with a nun at school, however, he decided that the military offered a more interesting life. When he was 17, Steiner was enlisted in the French Foreign Legion at Offenburg, and was sent to Sidi-bel-Abbes in Algeria. This satisfied his goal of going to Africa. Having being an integral component in different peace-keeping mission to different countries of the world which were plunged into war, he took a major part of play in Suez crises in 1956 when the northern Vietnam was faced by Viet Minh's. After he successfully carried out his assigned duty in Vietnam, he was later posted to Algeria where he met his future wife Odette, a Pied-Noir. The Legion hardened Steiner, and he was taken not only by the bravery but by the loyalty of his Russian, Hungarian, and French counterparts who, despite being adversaries only a few years before, were now steadfast comrades. While fighting the FLN (Front de Libération Nationale) uprising in Algeria, Steiner become active in the anti-De Gaulle Organisation armée secrète (OAS) through his wife. He was eventually arrested, sentenced to nine months in prison, and then released into civilian life. Despite being imprisoned for nine months in Algeria, he was never deterred from carrying out his humanitarian work as he volunteered once again to serve as one of the mercenaries who fought for the newly independent Republic of Biafra in 1967. For his dauntless performances and initiatives, Steiner was granted a commission into the Biafran Army with the rank of a Lieutenant, and Commander of the 4th Commando Brigade. The first three brigades actually didn't exist; the army created this bit of disinformation to confuse the Nigerian Federal forces courtesy of Rolf Steiner. Very dedicated and truthful soldier Rolf is, a man who never condone evil and sabotage, blew a whistle against Fredrick Forsyth who was an agent of M16 but was pretending to being on a neutral ground during the war. This valiant soldier had proposed that "if he is given 100 men, he would give them a quick special training and then use them to attack the Enugu Airport," which had fallen into the hands of the enemy. Following his preparation by Biafra's Head of State General Odumegwu Ojukwu, Steiner launched his operation (together with his troops), successively, against the Nigerian Airfield in Enugu. Consequently, the enemy jets which had taken off from Enugu Airport were pounding the nearby Railway Station on May 28, 1968. While the war was still intense, Rolf attested to that Biafrans are quick learners and highly motivated to defend their father land and enjoy total freedom despite using a skull and crossbones as his regimental symbol, which he as a reminder to his troops of the risks inherent in war. Today, we consciously remember his undaunted moves to destroying six Russian-made bomber and fighter aircraft of the enemy (Nigeria). We will not forget that Rolf Steiner blew the first enemy armoured vehicle to shreds, at Emene, by virtue of the landmine he had prepared and sited. Unlike other Soldiers of Fortune, Steiner was passionate about Biafra, and did not receive any pay for his efforts beyond room and board. 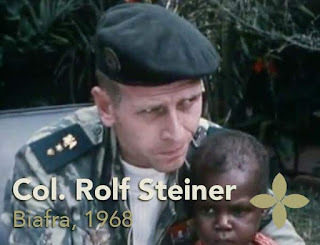 Steiner's guerilla warfare skills served the Biafran cause far better than the conventional warfare training most of the other commanders had received at Sandhurst. Unfortunately, following several confrontations with his Biafran colleagues, Steiner resigned from service as he bids goodbye to the land of the Rising Sun.